I have no idea whatsoever this organization does, but whatever it is I’m all for it! 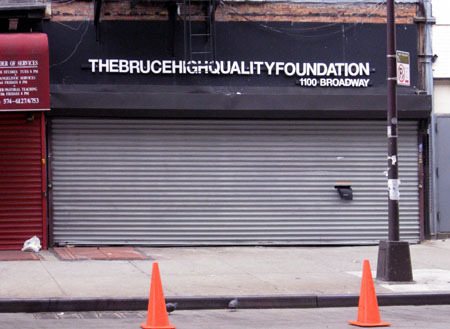 The Bruce High Quality Foundation, the official arbiter of the estate of Bruce High Quality, is dedicated to the preservation of the legacy of the late social sculptor, Bruce High Quality. In the spirit of the life and work of Bruce High Quality, we aspire to invest the experience of public space with wonder, to resurrect art history from the bowels of despair, and to impregnate the institutions of art with the joy of manâ€™s desiring. Professional Challenges. Amateur Solutions. These people are friggin’ awesome! Thanks for passing along the link!